This fine example of the Naga or pedestal bowl has a particularly lovely full-bodied shape, and features the typical decorative banding below the outer rim. This is a responsive and easy bowl to play. The fundamental note is a nice middle octave C# (383Hz) when struck with a padded mallet or played around the rim with a suede ringer. The rim note changes to a fifth octave G (780Hz) if a wooden ringer is employed. 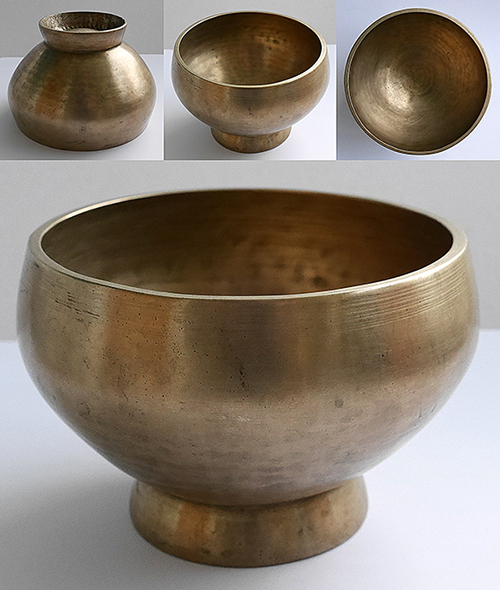 This Naga bowl is very well constructed and in excellent and clean condition.